Nicholas Cabral and Nicholas Bernier, co-founders of Goose River Hydro in Belfast, on Tuesday received a key Maine Public Utilities Commission certification that will advance their plans to generate electricity from small dams along the Goose River for as many as 560 customers. 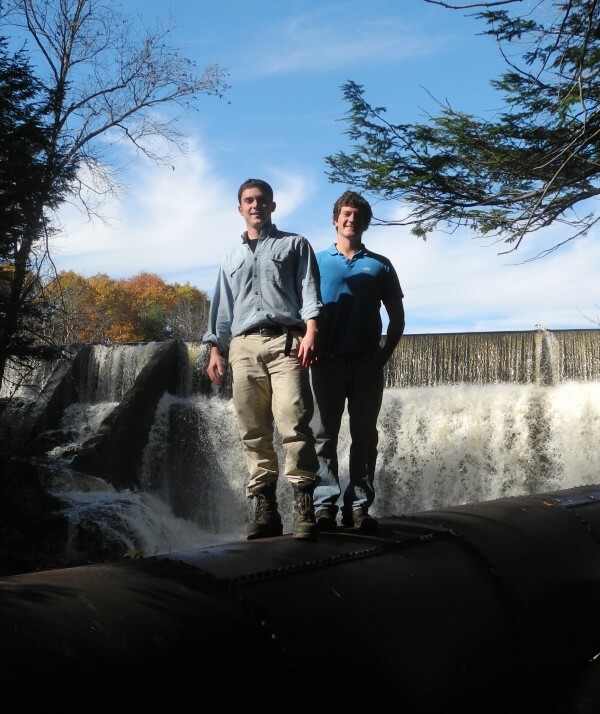 PORTLAND, Maine — Nicholas Cabral and Nicholas Bernier, co-founders of Goose River Hydro in Belfast, on Tuesday received a key Maine Public Utilities Commission certification that will advance their plans to generate electricity from small dams along the Goose River. Cabral and another Maritime Academy graduate restarted the small, Belfast-based hydropower project in 2013. Cabral also founded an affiliated hydropower startup, Surge Hydro, with a third Maine Maritime graduate, to develop lower-cost ways to retrofit old non-generating dams. Earlier this year, Surge Hydro was selected as one of eight energy and clean technology companies to participate in the competitive four-month startup accelerator MassChallenge program. The Goose River project, downriver from Swan Lake, consists of four dams licensed to generate about 430 kilowatts. One of those dams now delivers a fraction of that total licensed capacity to the grid. Four of the company’s dams are able to generate power, including its CMP, Mill Lane, Kelley and Mason’s dams. Mason’s Dam, which is currently generating power, is the first for Goose River Hydro Inc. The Maine Public Utilities Commission voted Tuesday that the Goose River project can fulfill the state’s Class I renewable requirement, limited to only “new” resources. A law passed in 2007 added to the requirement that suppliers fulfill 30 percent of demand from renewables, including biomass. That law establishing Class I renewable credits in Maine set out that, by 2017, an additional 10 percent of Maine’s power would come from “new” renewable resources, meaning projects that resumed operation or were substantially refurbished after September 2005. Cabral said the designation means a large jump in the value of its renewable energy credits. The project was previously allowed to collect Class II credits, which were selling at around $1 a piece. The Class I credits, he said, have been selling in the $20 to $30 range. “We get nailed with all of the same fees and stuff to play but we don’t generate the big power that [others] do, so it’s a big win getting classified as Maine Class I,” Cabral said in a telephone interview Wednesday. Regulators’ most recent report on that market showed the Class I market was dominated by biomass generators, which fulfilled about 92 percent of the state’s renewable requirements in 2014. The percentage requirement for Class I has continued to grow on schedule, hitting 9 percent this year, PUC Commissioner Carlisle McLean said Tuesday. Cabral, speaking Wednesday from a Boston office at MassChallenge, said that the company is still working out its financial modeling for retrofitting old dams but that he sees opportunity. “I think there’s a lot of potential that exists not only in Maine but in New England for new generation capacity on old idling infrastructure,” Cabral said.